A total of 10 people will win something. The following items will be given away. Cherry lumber for everything but the plywood panel under the cork and the plywood mounting base for the dartboard. Soft close Blum door hinges. Battery powered LED backlight that can also be powered via a USB power bank. The overall dimensions of the cabinet are 51-3/8” long, 12” front to back, and 25-5/8” top to bottom. Curly hickory sides, straight grain hickory top and bottom panel and splines, and curly maple interior lining. 1 Fourth Place Winner – Signed Stone and Sons Workshop Combohead Mallet. 5 Fifth Place Winners – Sticker pack from Jay and Shawn. The randomly selected winner will be determined by the Gleam giveaway and not by me or Shawn personally so please don’t ask us to pick you :) The giveaway ends at the time shown on the giveaway entry widget (end of February 8th, 2018). The winner will be announced immediately on this giveaway page so check back for the winner. The entire giveaway is open to everyone world-wide but the cabinet is only available for pickup only. WE WILL NOT SHIP THE CABINET. None of your information gathered will be shared or sold. I hate spam just as much as you do. We reserve the right to disqualify any entries that I deem suspicious of non genuine entries. Please help me keep this as fair as possible. By entering the giveaway you agree to sign up for Jay’s and Shawn’s email newsletter. By entering the giveaway you agree to these terms and conditions. All prizes are accounted for and emails have been sent. Thank you all for participating! I’ve learned alot from your videos. Thank you for that, because it allows me to work from home! Thanks to both of you for all the knowledge you share. I’d love a mallet. If I win the cabinet, I’ll sell it and give the profit to Jay and Shawn. They deserve to make money off that project. That’s a great looking Dart board, I remember watching the video when you put it out. Enjoy your videos! Thanks for all the sharing!! I’d accept the dartboard cabinet primarily because it would be cool to spend time with Jay and Shawn. We could then see who makes the best sawdust. But you can still get to it to be able to inspect it for quality, right? Really like watching your videos thank you for helping me learn wood working. Enjoy watching both you guys. It has helped me realize that this is a journey that has ups and downs but it is certainly worth the ride. Guys, this is great, but I would enter a drawing just to have shop time with either or both of you. The dartboard cabinet or anything made by either of you would just be a plus. Keep on keeping’ on~!! We love what you do~!! I like my dartboard y’all made for me. I love the videos that you guys put out. I always look forward to seeing the projects that you are working on. I feel like I have learned a lot from watching both of you. 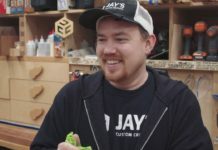 Thanks Jay, as always, an inspiration, Keep bringing it. I will come to Mississippi and meet you two!! :) -John. Thx guys ! I love the videos etc . They are great learning tools. 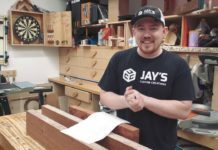 Great Concept , I really got alot of information from your content and very satisfied to follow you daily to increase my knowledge in Woodworking . personally , i’d recommend to follow this workshop . you will get a great exprience in wood working and learn how to do every thing easily and how to choose your materials , all is step by step and you can make life time projects efficiently . I love watching your videos. You always have great projects. I am currently working on a modified version of the horse bench and hope to post pictures soon. Really enjoy your video’s and I have learned a lot. If I win the cabinet I would donate it to a charity auction. But would really just like to meet both of you and see your shops. You both must spend a ‘lot’ of time cleaning to make a video. I thought saw dust on the floor showed you were working!!! If I am lucky enough to win the dartboard Please sell it and use the money for some other project and invite the second prize winner for lunch etc. your fantastic I love watching all your work. Would just love to have the two sticker packs… would look awesome in my shop..